A while back I detailed life on a starboard tack, and suggested that life would be better on a port tack. Here’s the comparative insight you’ve all been waiting for. The sail locker is still a horrendous, so no improvement there, but none expected, so fair enough. My favourite heads is much improved experience without the unsettling risk of being thrown half naked into the main corridor, so big tick there. Ty has still got specific parameters that need met on either tack that define his preference in regard to sleeping, so it’s impossible to establish that one. I suppose the big advantage to life in ‘Down Under’ on a port tack is that any water that comes through the mast boot at deck (which can be extensive in certain conditions) now runs straight into ‘Atlantis’, rather than Ty’s bunk, and Henry can be found curled up, soundly asleep, thumb firmly in mouth on either, so he’s all set either way. The nav station hurls less at you on port, which is nice, and the galley is definitely better. Sitting or snoozing on the saloon seating is also much better when you can only get further pressed into your cushion. The big losers are still the fridge and my bunk. Accessing the fridge has now caused such issues that there are calls for a big luff up when something from it is needed, which normally results in a big hove to. 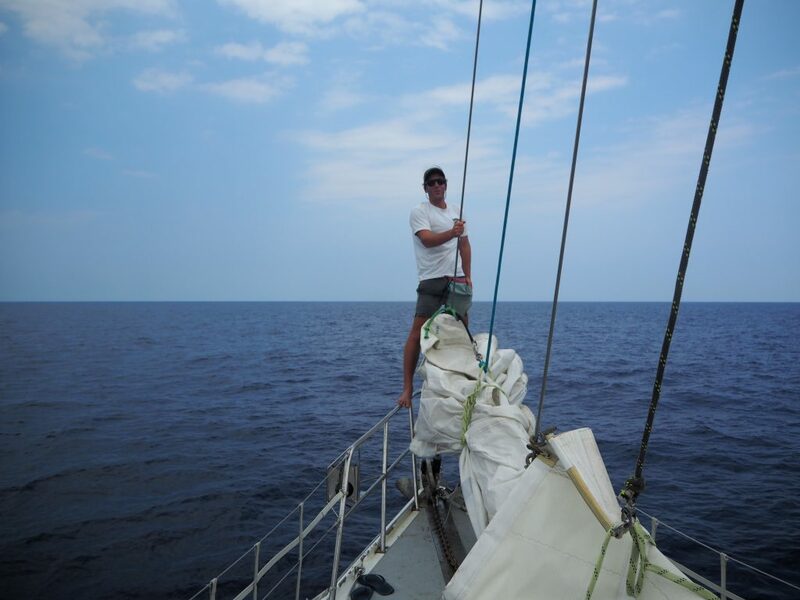 There was even talk for heaving to in order to carry out ablutions earlier, but that is definitely a level of softness not permitted on my boat, so we continue to sail hard to wind for everything except the fridge. 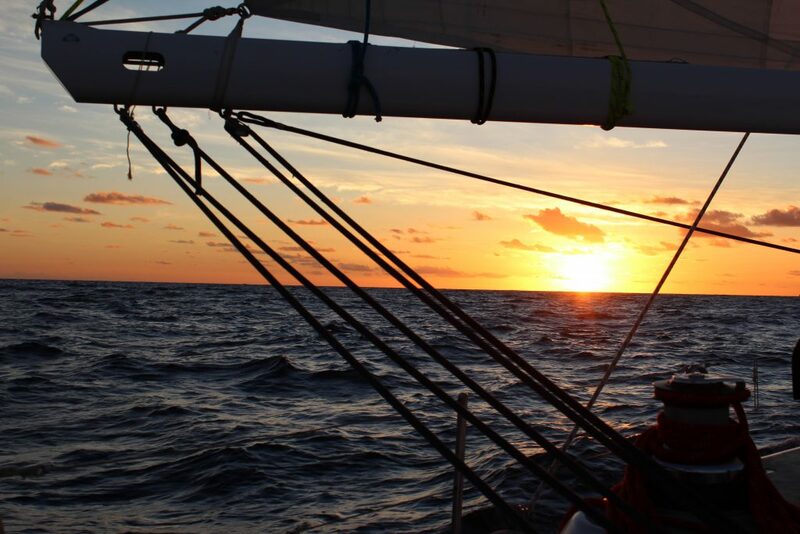 Our port tack east has been a cracker, ripping up the ocean towards the US. Much of the day has seen us lay our next waypoint perfectly, with very satisfactory speeds. One of my night watches saw us start to get consistently overpowered, to the extent I had the wheel a full turn over just to keep us straight. Not the sort of conditions you can dash from the wheel to ditch 20ft of mainsheet, so I had to stick with it until Henry came on deck and loosed off a whole load of main and the boat was a bit more under control again. After it soon got to a point where the leeward guard wires and stanchions were fully submerged more than not, we put a reef in. This lasted the length of Henry and Ty’s watch, until the wind went to bother someone else, and we needed the main back up again. This latest leg back from Hawaii is the first time in our time with Disco of going east. Everything up until now has been decidedly west. Other than our longitude going down instead of up, the other big difference is where the stars are relative to the boat. 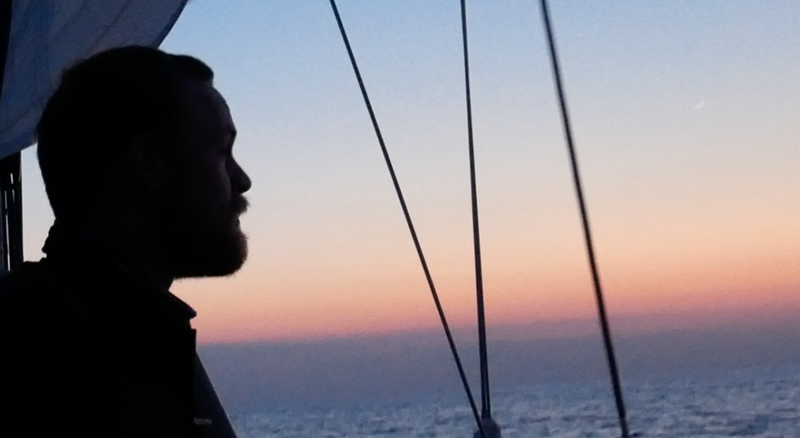 We’ve been used to certain constellations predominantly on a particular side of the boat for the last 6 months, which end up providing a subliminal reference to your direction. I keep getting caught out expecting certain stars to be there and finding they’re not. 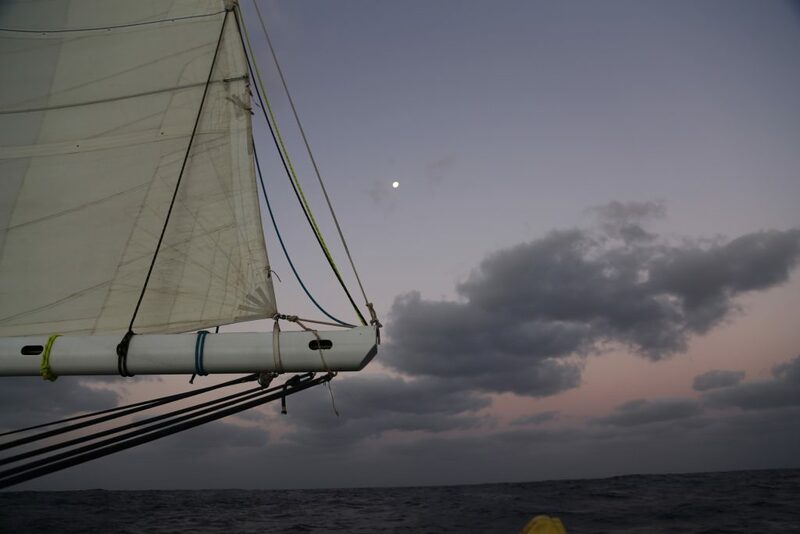 It brings back memories of traversing the Southern Ocean in 2013; we started in Rio, and had the Southern Cross, the landmark constellation of the southern hemisphere, on our right all the way to east coast Australia. It was very strange when we started going north towards the tropics to have it behind and then gone, not to be seen again for the remainder of that trip. 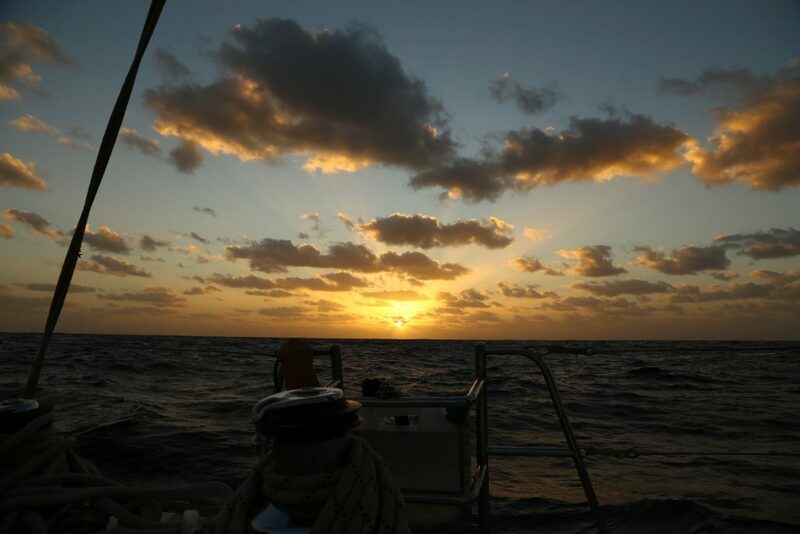 Nights are currently delivering a mix of conditions, with a moderate amount of squall activity making helming a fairly annoying and unrewarding experience for at least half the time. We leave the RADAR spun up so the big ones can be seen coming in, although as Renaud commented earlier, all that really achieves is a sense of anticipation that you’re about to get rained on, so is of debatable contribution to the helming! Night time on Disco also delivers some extremely sleepy people, a fresh (or not so) face every few hours, normally awake by the time they’ve managed to get up, dressed, make it on deck, and get to the helm. There are obviously some strange dreams going around for the last few nights, with most people commenting that they’ve woken from a rather peculiar experience. Maybe it’s what happens when the water in the tanks becomes more than a week old. Leftovers are big business here on Disco. Fresh food is far too much of a commodity to ever be wasted; therefore in the unusual case of there being anything left in the pan, it doesn’t stay there for long. Today is the longest I’ve ever known any food to remain unclaimed in the galley for, and I’m now simultaneously enjoying the leftovers of three different meals. Probably one of the few contexts in life that stir fry, tomato pasta sauce, and spicy tuna pasta tastes like a really good idea in the same bowl! I’m off to actually try and do the baking I’ve now been promising for days – it might happen this time around.